"Black Gaick of the wind whistling, crooked glens, ever enticing her admirers to their destruction" - An eighteenth-century Gaelic poem. I have had Exploring Scottish Hill Tracks by Ralph Storer knocking about for ages and it is a very readable guidebook full of interesting history and funny anecdotes. I selected the Gaick, filled a pannier and bungeed the tent on and got a train up to Blair Atholl. In the first part of the route you head up through some woods and out on to a huge wild moor. Then its a case of following the track alongside Edendon Water. This soon leads to a few river crossings where I miraculously managed to keep dry feet. As I headed toward Loch an Duin, which is really in a dramatic spot. I got a bit lost and had to push the bike through some heathery stuff on the side of An Dun, and then when I found the path not much of it was ridable for about a mile along the side of the loch. At the N end of the loch I had to squelch my way though a peat bog before another land-rover track appeared and I continued with no problems. With another couple of river crossings out the way I came across the ruins of the bothy where Captain John MacPherson (known as the Black Officer (how racist)) was killed in an avalanche in 1800. It must have been some avalanche. The bothy was a fair way back from the steep slopes and apparently, when it was destroyed, the roof was swept a mile or so down the glen. Then I passed Loch an t-Seillich which has a big dam at the end and a long down hill tarmac road all the way to Kingussie. On the way I found a good spot for the tent, ate malt loaf and finished reading The Time Machine by H.G. Wells. Its a great book with an interesting idea of how humans might evolve into two breeds. Firstly, the hairy, ugly, nocturnal, carnivorous, and industrious Morlocks who live underground. Secondly, the bald, dim-witted and beautiful Eloi who run about in the sun, picking flowers, fornicating, eating fruit and getting eaten by the Morlocks. The idea seems to be that the divide between the working class and aristocracy became so great that they became two radically different breeds of human. I liked it but not as much as The War of the Worlds which I think has a stronger ending. It is undoubtedly an important little book though as it was the first to introduce the idea of time travel (and coin the name time machine) and was the fore runner of science fiction. On Monday I cycled past Kingussie and Newtonmore down to Dalwhinne. On the way I dodged showers by popping into a cafe for breakfast. I took the track along Loch Ericht to Ben Alder Lodge and then up to Loch Pattack. From here there are great views of Carn Dearg, Geal Charn, and Beinn a Chlachair. I took the decision to go back the way I had come, rather than complete a circuit via Kinloch Laggan, because the rain was pretty miserable and I didn't want to miss the train. With half an hour to kill, I got a bowl of soup in Dalwhinnie and read about Bonny Prince Charlie, the Jacobites, and General Wade's military roads. Recently we saw Bronson at the movies. Its a dark comedy about Charles Bronson. He went to prison for stealing £26.18p in 1974 and he is still in jail now because he kept beating people up and taking hostages. He is undoubtedly a very bad person but he does have a fantastic moustache. In the film he is played by Tom Hardy and narrates his own life story. 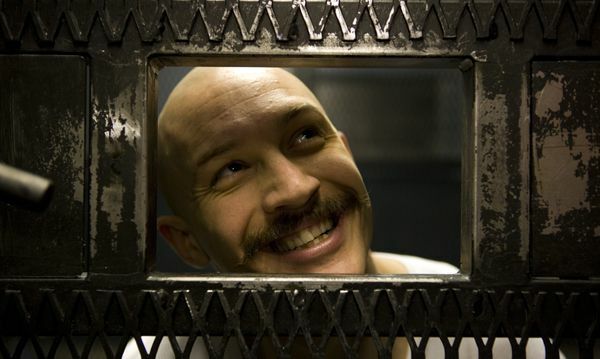 The film is told through Bronson's own warped and violent perspective and includes surrealist sets, a Monty Python style animation, weird characters and people getting beaten up to classical music or electro-pop. It feels a bit like a cross between Chopper and A Clockwork Orange. The film doesn't seem to want to make you sympathize with Bronson or offer any suggestion as to what motivates him to be so violent other than he wants to be notorious. According to Wikipedia, during one of his hostage taking incidents he demanded "a plane to take him to Cuba, two Uzi sub-machine guns, 5,000 rounds of ammunition, an axe and a cheese and pickle sandwich". Going to prison, or even working in one, seems to me decidedly risky with characters like that around. The other prison film we watched recently was Hunger. This was darker, more serious, and in my mind a bit lacking. The film is about members of the IRA who protested against being considered normal criminals because they wanted to be considered as prisoners of war, or at least as political prisoners. After smearing excrement on the walls of their cells and refusing to wear clothes, one of them Bobby Sands, begins a hungerstrike. There is a really long scene where the camera doesn't move and Bobby and a priest have an argument about his reasons for going on hungerstrike. The gist of this is that the priest thinks it is suicide (which is frowned upon by the Catholic church) and Bobby thinks it is murder (by Maggie Thatcher). Either way the rest of the film has no dialogue we just watch him shrink and die. I don't understand what the sectarian violence in Northern Ireland, and Glasgow to some extent, is all about really and this film didn't clear much up. To be honest if, like me, you knew nothing about the 1981 hungerstrike, after the film you wouldn't know much more. You'd be better off just taking 5 minutes out of you day to read this article. "The most exposed period for a winter or alpine climber is on the easy routes, PD’s, grade 2 gullies, moderate low angle cascades. Try to get through this period of climbing as quickly as possible, or better still get your skills up to scratch on rock, then transfer them over to easy hard routes, namely routes with belays, runners and avoid other numpty climbers who increase your chances of an incident dramatically. 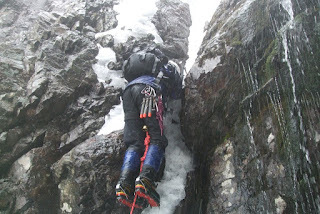 Sticking to the buttress has served Mick Fowler well. It will serve other climbers well." On a different tack, I found this funny and this worrying. Reminds me of the Blind Lemon Jefferson song, Black Horse Blues (and I'm taking slight liberties here). I've been doing up an old Trek 820. Had it shot blasted and powder coated black and put some shiny components on. Levers & Shifters: One of them is 2nd hand Deore LX and the other is a random 2nd hand one. For now I put the existing cantilever brakes back but I am thinking of switching to some Deore LX v-brakes I have on another bike. Put on a better saddle, maybe a Brooks B17. Magda and I got the train to Dunkeld and cycled to Dundee following The Salmon Run (NCN 77). It was a windy day, but there were some lovely bits of scenery, especially following the River Tay for a stretch into Perth. From Perth over Corsie Hill to Glencarse was also nice, especially as the wind was now behind us. The breeze pushed us along at a fair old pace from St Madoes, past Errol and on to Dundee in time for dinner (and some lively debate about God, crime, and masculinity) with Beata & Artur. Sunday promised to be a long day. We crossed the Tay bridge and set off west along the opposite coast. We passed Wormit, Balmerino and Hazelton Walls before reaching Newburgh. We ate some chocolate biscuits and drank some coke by the waterfront and then turned south and headed up hill. The road to Auchtermuchty is surely a strange one. We passed a rabbit rescue centre, a house with (at a conservative estimate) 1000 cats (plus geese, ducks and hens), an old gnarled walker on one bench muttering words of wisdom, and some freakish horror movie teddy bears on another bench. We were welcomed in to Auchtermuchty by the statue of Jimmy Shand (wiki), and pushed on toward Strathmiglo as the Lomond Hills loomed large in front of us. As we skirted round them we had a sustained gradual climb into a westerly breeze. The effort was rewarded by great views of Loch Leven and a pub lunch in Kinross. The next section was my favourite of the weekend: a climb up to Loch Glow. On the way I spotted a Kestrel and then we had a great descent through Blairadam forest to Dunfermline. By this stage it had got dark so we slinked into Inverkeithing and got the train home. It was a shame not to cycle all the way back to Edinburgh, but nevertheless a good trip. As well as being a comic strip and a tasty snack, Peanuts, is also a fast paced card game. Lindsay taught me this game as follows. Two players sit opposite one another with a standard pack of playing cards (without jokers) each. The backs of the cards must be different so they can be identified later. Each player shuffles a pack and then passes it to their opponent. Each player then deals out their cards in this way. and the remaining cards are left in a stock pile. Space should be left between the players for a maximum of 8 Suit Building Piles to be built up. The winner of each round of the game is the first one to get rid of all the cards in their Peanut Pile and shout, "Peanuts!" When play begins, the horizontal row cards can be played out into the Suit Building Piles, or built on top of one another to form columns of alternating colour and descending rank (King of Clubs, Queen of Hearts, Jack of Spades, 10 of Diamonds, etc). At the beginning of the game each player turns over the top card of his Peanut Pile this card can then be played either onto one of the horizontal row columns (as described above), into an empty cell in the horizontal row, or on to one of the Suit Building Piles. Once it is played you can turn over the next card in the Peanut Pile. Both players play concurrently and as fast as possible. They cannot touch their opponent's cards but both share the same 8 suit building piles in the middle, so you need to be quick before you are beaten to it. At the end of the game the cards in the Suit Building Piles are sorted and counted. The winner is awarded 10 points for winning and an additional point for each card he got out into the Suit Building Piles. The loser gets 1 point for each card he got out into the Suit Building Piles and -2 points for each card remaining in his Peanut Pile. Can be played in teams of 2 or 3 on each side. For instance, if there are 3 on each team, the first player controls the horizontal row, the second player controls the draw pile, and the third player the Peanut Pile. They can only touch the cards in their control, but can shout at each other as much as they like! For 2 players in a team one player controls the Peanut Pile and the other controls the horizontal row and the draw pile. Yesterday, I put in a long run from Crainlarich to the Falls of Falloch near Inverarnan along the West Highland Way. It rained continuously with the wind in my face all the way there. I then ran back with the wind and rain on my back. Dripping, I joined the girls in the pub for a hot coffee and some sticky toffee pud with custard. Ahh! Today I finished reading Thunder and Sunshine by Alastair Humphreys. Russ gave me his first book Moods of Future Joy for my birthday last year. The second book completes his low budget journey around the world by bicycle. It is better written than the first book, both in terms of being a more interesting read and having a more fluent pace. In Moods he dwelt, a little too much for my liking, on his own moods, crying, and navel gazing. In Thunder he is more outward looking with great descriptions of the places he travels through and he gets stuck in with a confidence and an upbeat outlook. There are still a tedious number of quotations littered everywhere, but thankfully some humor too. Such as this conversation with a Chinese Dad. "Yes, Lady Dee Die. You life red and white?" "Yes I like riding a bike." If you'd like to read it too let me know and I'll post it to you. Alastair is now raising sponsorship for another challenge, SOUTH, the longest unsupported polar journey in history. Go him! A Day of Musli, Coffee, Cider, Fish Cakes, Tea, Cake, Sandwiches and Pizza. With some cycling inbetween. With sunshine in our faces and the wind on our backs, Magda and I cycled along the coast to North Berwick (with a silent 'w'). Then into rain and a headwind we battled home. For much of the route we followed the road, but quite often we were able to use the John Muir Way. Not to be confused with the John Muir Trail (a long distance trail covering 211 miles of dramatic Sierra Nevada mountains in California, forming part of the humongous Pacific Crest Trail which is 2,650 miles long) the John Muir Way is an incomplete 45mile long footpath in decidedly undramatic East Lothian. After pottering through Portobello, Musselburgh and Prestonpans, we found a great fish and chip shop. We sat against the front of the shop, acting as a sun trap, and leisurely enjoyed our lunch, washed down with a pint of cider. A group of women walking along the path also stopped here, although we had our suspicions their lunch was purely liquid one. Next we headed across the golf course at Gullane and followed the JMW, instead of the increasingly busy A198, all the way to North Berwick. Here we had a quick scoot around the town, a cup of tea and a bit of cake and headed back. The rain descended and the wind picked up, but we hunkered down and got on with it. Sticking to the roads for the extra speed factor we whizzed back home for pizza and a movie.